Happy National Volunteer Week! This week, we’re celebrating just a few of the amazing volunteers who generously give their time and expertise on Habitat boards and committees, on build sites, in Habitat ReStores and offices, or on Habitat for Humanity Canada Global Village trips. There are so many different ways to get involved with Habitat for Humanity. Here are a few more amazing volunteers, nominated by local Habitat for Humanity organizations across the country for their volunteer efforts. Find your local Habitat and start volunteering today! 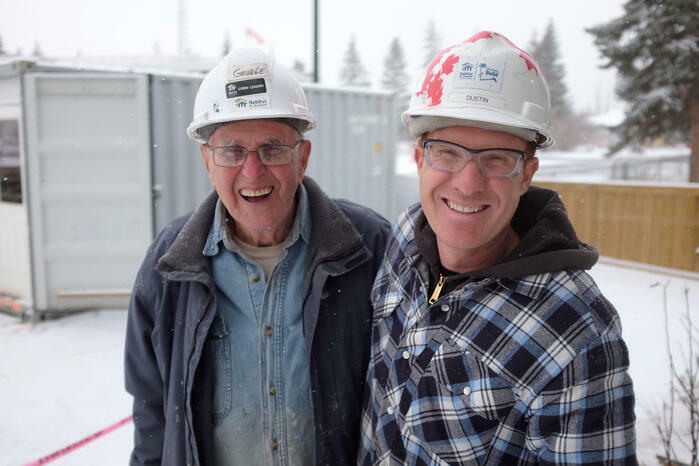 Volunteers are a vital part of Habitat for Humanity Southern Alberta, and without these dedicated individuals it would not be possible for Habitat to help families in our community. Over the years, we have been fortunate enough to have met many amazing volunteers. One volunteer in particular, George Proctor has been actively volunteering with Habitat for 26 years. George began his journey with Habitat in 1992 when a member of his church signed him up for his first volunteer shift. That same year, Habitat was given the opportunity to re-purpose wooden shelving from a local distillery as a way to raise funds. George, who is passionate about re-purposing, remembers dismantling and salvaging the wooden shelving units during his first shift with Habitat. When asked what motivates him to continue showing up to the construction site every week, he says it’s because of the stability young families find when they own a Habitat home. During a home dedication, George recalls watching a child excitedly run out of his new home with a massive grin and announce, “I have my own room!” This moment, and others like it, has stuck with him over the years. Two years ago, George was hospitalized for 10 days because of a flu that progressed into pneumonia. He was given a 30 percent chance of walking out of the hospital by the doctors. George contributes his survival and longevity to his continued work with Habitat for keeping him active and fit over the years. “At his Habitat volunteering retirement party that we had just last month, he told me he would see me the next day to volunteer, and he did,” said Dustin Burgess, construction site supervisor (pictured to the right of George above). George is now 90 years old, a crew leader who has helped build 214 Habitat homes, donated over 25,000 volunteer hours. And his generosity doesn’t stop there. During his spare time George re-purposes construction waste to create unique gifts for the future Habitat homeowners. If you ever have the pleasure of meeting George on the Habitat construction site, he will happily tell you heartwarming stories about the children that are given a sense of security because of their Habitat home. Thank you, George, for your outstanding dedication to Habitat for Humanity! By Ashley Miller. Thank you to Habitat for Humanity Southern Alberta for sharing this story!